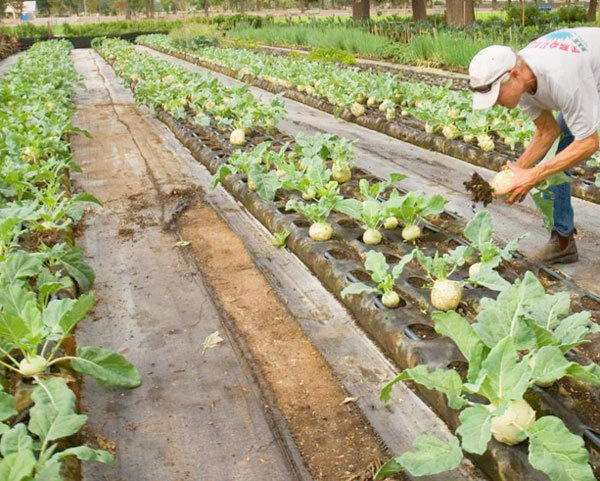 Each of Tender Greens’ two Irvine restaurants receives 100 to 125 pounds of produce three times a week from Alegría, which grows 80 different fruits and vegetables using water-efficient farming methods. Striking such partnerships is part of the 9-year-old chain’s planet-friendly ethos. While shopping last year at the farmers market at the Great Park, Bent, executive chef at the Irvine Spectrum Tender Greens, noticed a tiny little farm in the distance. Bent, who formerly worked at Alice Waters’ pioneering slow-food cafe Chez Panisse in Berkeley, wandered over and met a jovial farmer, Erik Cutter. Cutter’s 1-acre farm, to Bent’s amazement, was growing dozens of different fruits and vegetables on concrete. Cutter’s operation hit Tender Greens’ wheelhouse. 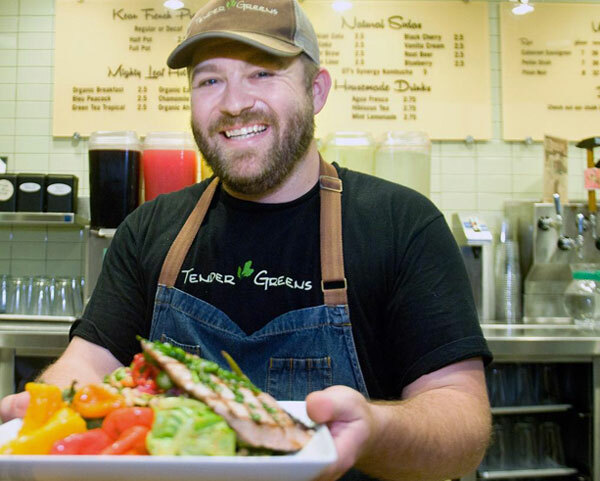 Founded in Culver City in 2006, Tender Greens is a counter-service chain that embraces the “slow food” movement. Every operational move is aimed at reducing the restaurant’s carbon footprint. Wine, beer and house-made sodas are served from a draft system. No bottles. Each restaurant, including the two in Orange County, offers a menu that rivals haute gastropubs – minus the premium price tag. Sandwiches, salads and protein dishes cost $11.50 and contain a bounty of fresh produce – all delivered from local farms within 24 hours of being picked. In recent years, Tender Greens’ conservation efforts have centered on working with innovative growing systems that require less water. At its Hollywood restaurant, 24 vertical aeroponic towers ring the patio dining area. 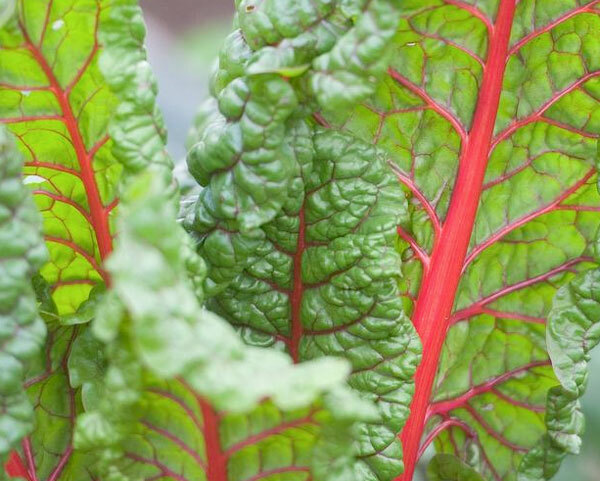 The soil-less planters overflow with everything from rainbow chard to arugula, all grown using 95 percent less water. At the two Tender Greens restaurants in Irvine, a partnership with Alegría launched within a couple of weeks of Bent’s visit. Cutter, whose 3-year old Great Park farm is 2 miles from the Spectrum, often handles each delivery. “Basically, what we are pulling (from the ground) is in the restaurant within an hour,” he said. Tender Greens’ Oberholtzer said sourcing from hydroponic farms costs the company about 10 percent more than if it got its food from other suppliers. But such practices are vital to the food chain, he said. Rising food prices, combined with extreme weather conditions, have created a demand for hydroponic farming. From 2010 to 2015, the market has grown 3.3 percent to $555 million and accounted for some 1,500 businesses in the U.S., according to a January report by IBISWorld. In Orange County, two Irvine farms are taking advantage of the demand. At Alegría, Cutter grows everything from curly kale to spicy peppers using vertical hydroponic towers or a nutrient-dense GardenSoxx system. The latter looks like traditional farming, but instead of growing food in-ground, Cutter is stuffing organically grown nutrient-rich soil (he makes his own blend) into a mesh-like material made of polypropylene. The tubular-looking Soxx, which is recyclable, can be set up on cement or other manmade surfaces. Cutter also grows peppers, herbs and strawberries from vertical hydroponic towers that use 100 percent certified organic “coir” – a coco fiber – instead of soil. The advantage of both growth media? Each absorbs and holds water longer than conventional in-ground farming. As a result, Alegría’s drip-irrigation system uses 75 percent to 90 percent less water. Locals chefs have started to take notice. “It was amazing what they had growing on that acre,” said Cathy Pavlos, chef-owner of Lucca in Irvine and Provenance in Newport Beach. Pavlos began working with Alegría this year. Besides Tender Greens in Irvine, Alegría also works with Bluewater Grill in Tustin, Pelican Hill Resort in Newport Coast, Ky’a Bistro and Big Fish Tavern, both in Laguna Beach, and several Orange County juice bars. “Not only does he save water, but (his produce) just tastes better,” said Jim Ulcickas, owner of Bluewater Grill. 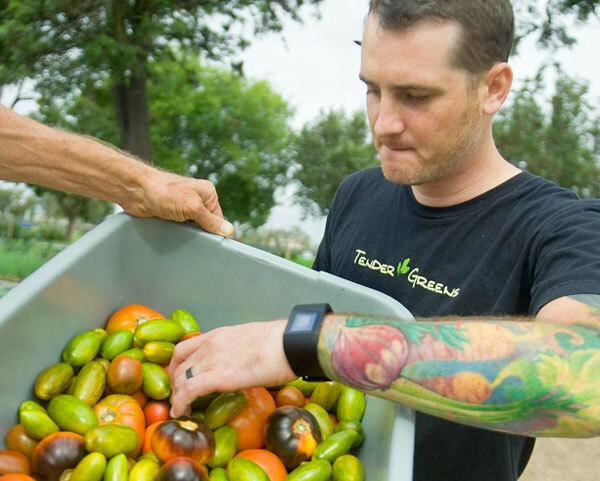 Ulcickas said his restaurants in Tustin, Newport Beach and Redondo Beach use Alegría’s tomatoes exclusively on sandwiches and salads when in season. The farm also provides herbs and strawberries to Bluewater Grill. 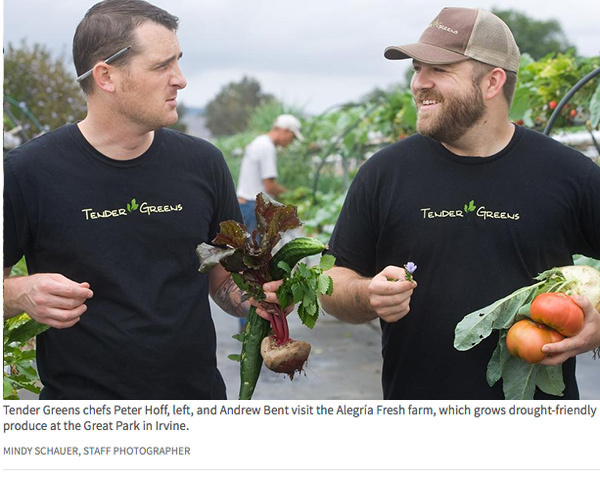 Tender Greens chefs Hoff and Bent say they visit Alegría every few weeks for inspiration. As for that juicy tomato? The chefs created a gazpacho soup special. “There’s nothing like having your own farm and picking your own food,” Bent said. using it's organic Soxx production system. About 5 miles from Alegría, Urban Produce in Irvine is taking vertical farming to the extreme. The year-old hydroponic farm is inside a 5,800-square-foot warehouse space. Artificial lighting shines on dozens of 25-foot-tall aluminum towers capable of producing 16 acres of food – from wasabi bok choy micro greens to wheatgrass. When operating at capacity, the hydroponic farm uses less than 100 gallons of water a day. Recently, the company started experimenting with a Skywell system, which extracts moisture from the air to create fresh drinking water. Urban Produce uses roughly 93 percent less water than a conventional farm of the same size. “Our ultimate goal is to be completely off the grid,” Chief Executive Ed Horton said. The company began distributing its specialty produce and micro greens earlier this year. Its clients: Albertsons, Fresh & Easy, Gelson’s, Cucina Enoteca in Newport Beach, Greenleaf Chophouse in Costa Mesa, The Dock in Newport Beach and My Cuppa Juice in Lake Forest. Horton’s business plan calls for opening 100 “urban farms” over the next five years across the U.S. “The installation of the Skywell unit advances our efforts toward water conservation and positions us at the forefront of sustainable agriculture,” he said. while providing up to 3X more produce per acre. Other Orange County restaurants are aiming their drought-busting efforts directly at the plate. Zov’s in Tustin, Clay Oven in Irvine and Bistango in Irvine are swapping water-hogging foods like beef for water-friendly proteins such as pork and lamb. The number of gallons needed to produce a pound of beef varies, depending on the source. According to Water Footprint Network, a pound of beef requires roughly 1,800 gallons of water to produce. Much of that water is needed for cattle feed. Pork requires 576 gallons. Sheep, 731 gallons. With that in mind, veteran Orange County chef Zov Karamardian recently replaced a top sirloin dish with pork chops on her menu. Bistango introduced a “Game and Fowl” menu recently. It includes drought-sensitive proteins – bison rib eye, rack of venison and Jamaican jerk duck breast. Karamardian estimates water savings of more than 1 million gallons a month by selling 2,170 pork dishes instead of beef at her restaurants in Tustin, Irvine, Anaheim and Newport Beach. At Clay Oven in Irvine, chef-owner Geeta Bansal doesn’t serve asparagus, which is considered the water guzzler of vegetables. She favors kale, broccoli, cabbage and carrots. She recently redesigned her menu to include water droplet icons next to dishes that save water, such as those with wild boar, lamb, elk and venison. Bansal said she did it to create awareness. Local conservationist Evan Marks said any step that makes water savings a priority helps shift behavior. 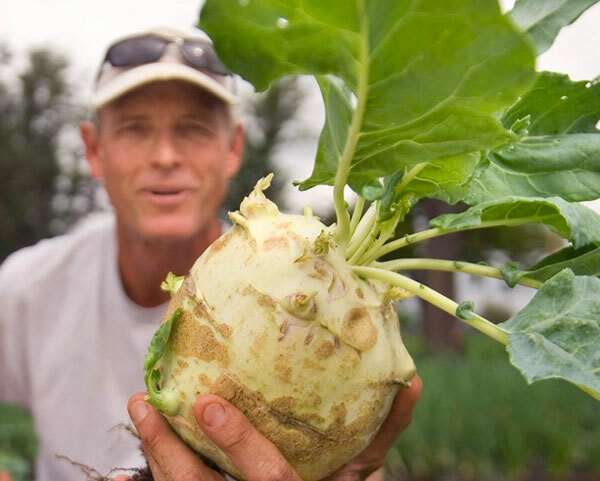 Erik Cutter shows off a freshly harvested Kohlrabi. Some restaurants are turning to the back of the house to save. About two months ago, Haven Gastropub installed a $270 air compressor in its “dish pit” to help dry-rinse plates using air instead of running water. “It’s morally responsible for us to constantly find ways to reduce our carbon footprint,” said Wil Dee, a founding partner at the Orange restaurant. The operators of Green Tomato Grill said they’re looking to install an air compressor at their fast-casual restaurant, also in Orange, as well as a second location slated to open later this year in Brea. At Bluewater Grill in Tustin, the kitchen is equipped with a machine that turns liquid waste into recycled water, owner Ulcickas said. Dee Nguyen, chef-owner of Break of Dawn in Laguna Hills, has taken a bold step to save: He’s stopped serving tap water. He charges customers at his award-winning breakfast cafe 25 cents for a 16.9-ounce bottle of Costco’s Kirkland water. He started three months ago, and so far, only one complaint, he said. His thinking: He conserves by not having to wash water glasses and by not using filtered tap water. All the plastic bottles are recycled. Haven’s Dee said small adjustments make a difference. Haven’s water bill, shared with a few other businesses, dropped 9 percent last month. greens and vegetables received an hour earlier.